What I found after wrapping up a solid hunting season was that my playbook wasn’t designed for taking kids waterfowl hunting. So I threw it out and designed a new one. When I fell head over heels in love with bowhunting, I sold a grip of my duck and goose decoys. At the time, I thought nothing of it. I was 19, full of piss and vinegar, and ready for the next phase in my life as a hunter. That phase — roaming the woods with a stick and string — stuck. Bowhunting was all I could think about, all I wanted to do. Today, at age 38, my love affair with bowhunting is as strong as ever. My wife has concluded that this “phase” I came into while we were still courting will never fade. I agree. However, now a father of three youngsters eager to go waterfowling, I’ve had to reopen my duck and goose playbook. What I’ve found after wrapping up a solid waterfowl season is that my playbook wasn’t designed for taking youngsters, and I had to throw it out and design a new one. Here are six tips to keep in mind when you take your kids out to chase ducks and geese. Back in my high school days, I would never have pulled out of a goose field or spread of duck decoys along an icy river because I was too cold. This past season, I had to bail on two amazing decoy setups because my youngest son and my only daughter got too cold before the birds ever showed. My oldest son Hunter was able to stay in the decoys on both occasions with some of my buddies and was treated to some feet-down action. I, on the other hand, drove my pair of frigid youngsters to McDonald’s and returned both times to see ducks and geese falling from the air. The cool thing was my two youngest didn’t care a bit. They whooped and hollered as flight after flight dropped in on their big bother. Honestly, I didn’t care either. These hunts weren’t about me. They were about introducing my children to the outdoors, and the last thing I wanted them to have was a negative experience. When the kids are cold or simply burned out, go home. It isn’t worth making them miserable. One bad experience can ruin hunting for them for life. Like many, I prefer to decoy ducks and geese when Mother Nature is at her worst, when ice pellets pound the parka and toe-wiggling in the waders is the only way to confirm your tootsies haven’t fallen off. I have found, however, that duping birds on bluebird days is possible, and quite enjoyable. For starters, warm-weather days often mean less competition, especially if you’re hunting public land or highly pressured private parcels. 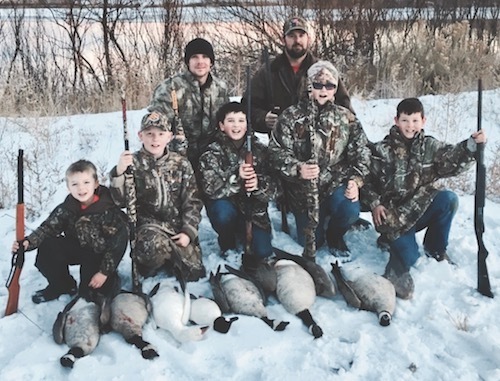 This past season, my kids and I had some great public-land duck and goose shoots on days when the temps crawled into the 60s, and there were no other hunters in sight. Another benefit to warm-weather decoying is, well, not being cold. The kids can have dirt-clod wars, build elaborate blinds from corn stalks and other in-the-field debris, and, if you’re like us, have a few serious wrestling matches. They’re spending time with you in the outdoors. They aren’t miserable, and they can have fun just being kids between flights of birds. In addition, on those warm-weather days when the birds are few and far between, let them work on their calling. If the ducks or geese aren’t working right, ask them what they think they should do to the decoy spread. If you make them think and teach them to call, they will be able to do it on their own one day. Yes, decoying can be fun, but it can also be boring and time-consuming. My kids, even the oldest, love to jump canals, creeks, sloughs and tiny ponds. Not only is it great exercise, but jumping ducks and geese is a riot. It’s fast action, and when the mercury plummets, it’s a great way to get kids on birds and then back in the truck and moving on to the next spot. Jumping ducks and geese, in my opinion, is a lost art. When jumping fowl, take your time. Part of the fun, especially for the kids, is the sneaking and glassing. By going slowly and not taking any shortcuts, you’re teaching your youngsters to become hard-working hunters. These tactics, if learned at an early age, will serve them well when they start chasing big game. Jumping ducks and geese also teaches teamwork and is awesome for reinforcing proper gun safety habits. On any given jump, you will likely have to cross fences (unload the firearms and hand them over to one another, right? ), crawl and, once you reach the area and spread out, ensure each shooter shoots his or her own zone. On windy days, I love taking the kids to nearby reservoirs and ponds for pass-shooting ducks and geese as they filter off. Before you tell me it’s not “pure waterfowling,” give it a go with your kiddos. Few things trump the excitement of low-flying ducks and geese, birds that are treetop high and talking like crazy. Oh, and get in the path of thousands of migrating snow geese and you will likely be making a trip to the store for more ammo when the hunt is over. Because the birds are flying fast, pass-shooting is great shooting practice. It really teaches one to pick a single bird (just say no to flock shooting) and lead that bird properly. The more kids shoot, the more comfortable they become with swinging, obtaining proper lead, etc. That makes them more confident. Yes, I’m climbing on my soapbox. Every year I see throngs of youngsters not wearing ear protection. Not a good idea! Hearing loss can’t be fixed, but it can be prevented. Train your kids to wear ear plugs, and they will wear them for life. Personally, I recommend a pair of Razor Series Slim Shooter Folding Muffs from Walker’s Game Ear. They are inexpensive, and kids can slip them on and off easily. Plus, you’ll find the biggest complaint youngsters have with hearing protection is they can’t hear outside sounds. These muffs are frequency-tuned for natural sound clarity. My kids, especially my daughter, love cleaning our harvest. Yes, the three of them make a mess. I spend more time washing the meat and sweeping up feathers than I would if I handled the chore alone, but handling the chore alone doesn’t teach the kids a thing. When you make your kids part of the meat-cleaning process, they develop a deep respect for the game they harvest. They learn proper meat care, and nothing makes their little faces light up more than when you cook and serve the meat. 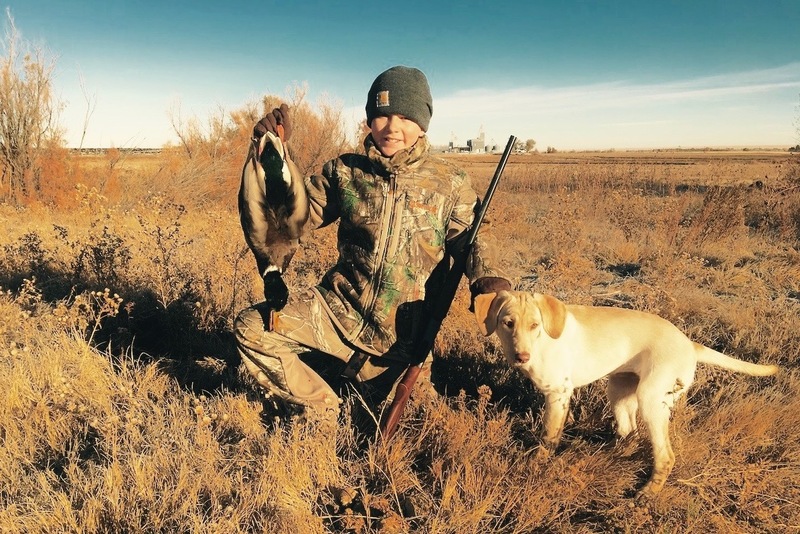 There you have it — six tips to making this year’s waterfowl season with your kids one you all will both remember for the rest of your days.